Smile-A-Mile is love. It’s family. It’s smiles. It’s a sense of “normal” in a life of chaos and uncertainty. It’s hope when you struggle so hard to find it. 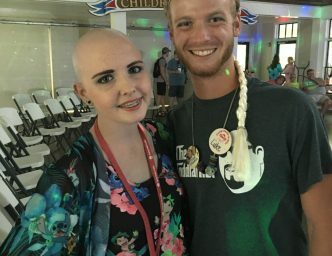 Whether it was activities in the hospital or the camps at Lake Martin, the men and women who dedicate their time and energy to this amazing organization made this new life bearable for my spunky and sassy daughter. My girl loved them so very much, and all she wanted was to beat cancer and become a camp counselor herself. She never got that chance, but even though she is gone, Smile-A-Mile still looks out for me and her little sister. We are still part of the family, and we always will be. Smile-A-Mile helped my girl find a place where she felt she belonged, where she felt safe and could be herself with others who understood. I will forever be grateful for that.